The Vancouver Sun cites a new Angus Reid Opinion Poll. The poll compares West Coast Americans compared to varying provinces in Canada. Bigfoot, also often known as “Sasquatch” in Canada, is said to be an extremely tall and hairy primate, almost nine feet (2.75 meters). 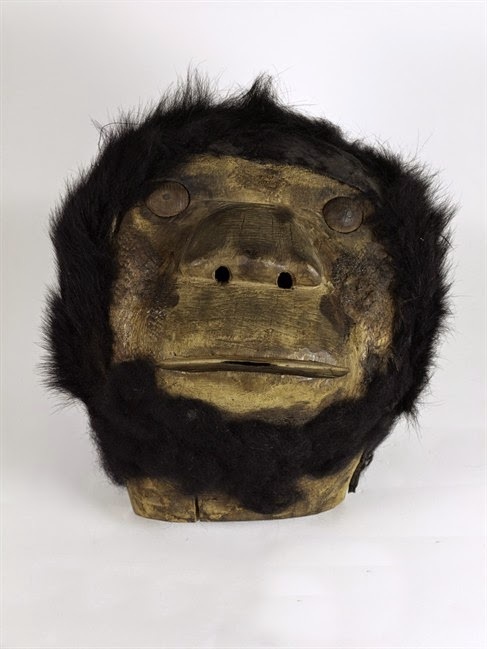 The rarely-seen, or never-seen (depending on your view), creature is said to live in remote areas of Canada and the United States, particularly in Cascadia (also known as the Pacific Northwest). 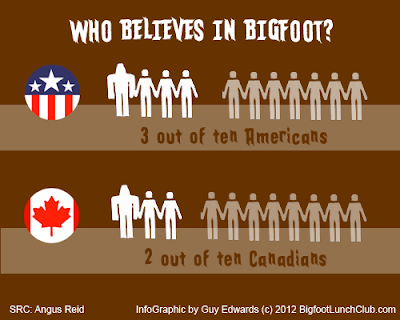 The Angus Reid survey of more than 1,000 Canadians and 1,000 Americans found that the Bigfoot phenomenon is bigger in the U.S., where 77 per cent of respondents claim to have heard “a great deal” or a “moderate amount” about Bigfoot (compared to 61% of Canadians). 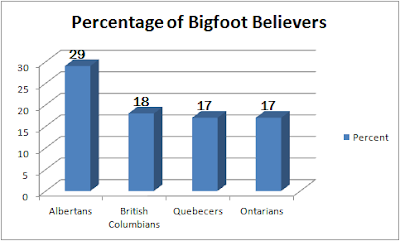 In Canada, Albertans (29%) are more likely to think that Bigfoot is real than British Columbians (18%), even though B.C. is supposed to be prime Bigfoot territory. Nineteen percent of Quebecers believe Bigfoot could be the real deal, compared to 17 per cent of Ontarians (17%). In the United States, respondents in the West (32%) are more likely to believe that Bigfoot is real.